As a medical doctor in Westland, Dr. Mahmood Hai has treated thousands of patients in Michigan and helped develop a new technique with lasers to treat prostate enlargement that has helped more than 1 million patients. What motivates him is his faith: Islam. Hai is one of many doctors in Michigan who are Muslim and contributing a lot to society, according to a new report released this month by the Institute for Social Policy and Understanding, a think tank started by Muslims in Michigan with offices in Dearborn and Washington, D.C.
As Ramadan, a holy month of fasting and spiritual reflection, starts today for Muslims around the world, the report seeks to educate the public with stories of success in Michigan. The report estimates the number of Muslim medical doctors in Michigan could be more than 15%, as well as more than 10% of the state’s pharmacists. There are 35 Muslims in Michigan who hold public office, and more than 700 attorneys in the state are Muslim, the report said. It also detailed Muslim contributions in other areas such as business and technology. “We … reveal important and oftentimes overlooked contributions by Muslims to the state,” says the report, written by doctoral student Rebecca Karam of the City University of New York. The study comes during an anxious time when some Muslims and immigrants feel under attack. Hai, an immigrant from India who has lived in the U.S. since 1973, says that many patients speak highly about their personal doctors who happen to be Muslim, but might not make the connection when they hear about Islam and Muslims in general. Titled “An Impact Report of Muslim Contributions to Michigan,” the study includes empirical data to showcase Muslim accomplishments, but cautions some of the figures are estimates. Determining the population percentages of Muslim doctors in Michigan was derived by looking at a database of names of doctors statewide and comparing that to a list of names that sound Muslim, the report says. The list of Muslim names came from Muslim communities and groups, including the Council on American-Islamic Relations. It said the Muslim names were of various ethnicities, including Arab, west African, Eastern European and others. The report cautioned that some doctors with names that sound Muslim could be non-Muslim, and there might be other Muslim doctors without Muslim-sounding names. Another doctor featured in the report is Dr. Farha Abbasi, an assistant professor of psychiatry at Michigan State University, who works on mental health issues among Muslims. She established the Muslim Mental Health Conference and is managing editor for the Journal of Muslim Mental Health. Young Muslims are facing unique stresses because of negative views about them, she said. The report hopes to show that Muslims can be open about their faith while serving their communities. Hai started doing research in the 1990s for a new technique using lasers to reduce a common condition afflicting men: enlarged prostate gland. 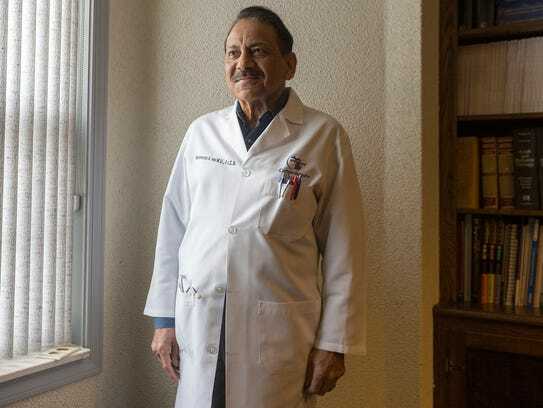 Born in India to a medical doctor who once served a former president there, Hai moved to Detroit in 1975 for a medical residency at Wayne State University before starting his urology practice. He said his family has always believed in serving the community where you live.